Muhammad Wilkerson (born October 22, 1989) is an American football defensive end for the New York Jets of the National Football League (NFL). He played college football at Temple, and was drafted by the Jets in the first round of the 2011 NFL Draft. Wilkerson attended Linden High School in his hometown of Linden, New Jersey. He recorded 78 tackles, five sacks, one forced fumble along with one fumble recovery in his senior season. He was named to the All-Watchung Conference first-team in his junior season. He was selected to the Home News Tribune all-area first-team and Newark Star Ledger all-Union County second-team. He also helped lead Linden to state titles during his junior and senior years in basketball. Note: In many cases, Scout, Rivals, 247Sports, and ESPN may conflict in their listings of height, weight and 40 time. "2007 Temple Football Recruiting Commits". Scout.com. "Scout.com Team Recruiting Rankings". Scout.com. After high school, Wilkerson spent a year at Hargrave Military Academy. He subsequently enrolled at Temple University, where he played for the Temple Owls football team. As a freshman at Temple in 2008, Wilkerson played in 11 games and recorded 13 tackles and a sack. As a sophomore in 2009 he started all 13 games and recorded 58 tackles and six sacks. As a junior in 2010 Wilkerson recorded 68 tackles and 10 sacks. Following his junior season, he was named to the first-team All-MAC selection and the team defensive MVP. All values from NFL Combine. Wilkerson was initially what analysts termed "a sleeper selection"; however, following positive results at the NFL Combine and at Temple's Pro Day session, Wilkerson's draft stock rose significantly. He became regarded as a versatile prospect whom NFL Network Analyst Mike Mayock compared to Trevor Pryce, concluding that Wilkerson was a first round prospect. Wilkerson was drafted by the New York Jets with the thirtieth overall selection in the 2011 NFL Draft. He was the fourth Temple player to be drafted by the Jets, preceded by Mike Stromberg, Joe Klecko and Dave Yovanovits. He also became the Owls' highest draft pick since Paul Palmer, who was selected nineteenth overall in the 1987 NFL Draft. Head coach Rex Ryan reiterated Wilkerson possesses similar attributes to Trevor Pryce. 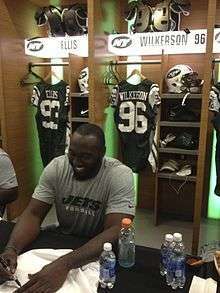 Wilkerson signed a four-year, $7.4 million contract on July 31, 2011. During the third preseason game against the New York Giants, Wilkerson got into a fight with running back Brandon Jacobs, resulting in both players getting ejected. He made his NFL debut in the season opener on September 11 against the Dallas Cowboys, and recorded his first career sack a week later, sacking Jacksonville Jaguars quarterback Luke McCown in the end zone for a safety. Wilkerson started all 16 games in 2011 making 49 tackles with 3 sacks, 2 passes defended, 1 forced fumble, and 1 safety enforced. During a game against the Seattle Seahawks on November 11, 2012, Wilkerson scooped up a fumble lost by Russell Wilson and returned it for a touchdown. The Jets lost the game 7-28, however. In 16 games (15 starts) of 2012, Wilkerson made 69 tackles with 5 sacks, 4 passes defended, 3 forced fumbles, and 1 fumble recovery returned for a touchdown. Wilkerson finished the 2013 season with a combined 63 tackles, 10.5 sacks, 2 FF, and an int. For his outstanding play, he was selected to his first All-Pro team. During Week 17 against the Buffalo Bills on January 3, 2016, Wilkerson suffered a broken leg and was carted off the field as the Jets lost the game 17-22 and were eliminated from playoff contention despite finishing the year with a 10-6 record. In 16 games, Wilkerson made 64 tackles, 12 sacks, 7 passes defended, and 3 fumble recoveries. He was a Pro Bowl selection for the first time of his career. On July 15, 2016, Wilkerson signed a 5-year deal worth $86 million featuring $53 million guaranteed and a $15 million signing bonus. Wilkerson is a Muslim, whose mother Janice wears a hijab. Due to his involvement in sports, he does not fast during the month of Ramadan, but intends to in the future. 1 2 3 "Temple Profile". owlsports.com. ↑ "Muhammad Wilkerson". NFL Draft Scout. Archived from the original on April 29, 2011. Retrieved April 29, 2011. ↑ "Muhammad Wilkerson". National Football League. Archived from the original on April 29, 2011. Retrieved April 29, 2011. 1 2 Wilson, Aaron (March 21, 2011). "Temple DL Muhammad Wilkerson to work out for Ravens, Chiefs this week". National Football Post. Archived from the original on April 29, 2011. Retrieved April 29, 2011. ↑ "Defensive players lead the way on list of top 32 prospects". National Football League. March 11, 2011. Archived from the original on April 29, 2011. Retrieved April 29, 2011. ↑ Cimini, Rich (April 15, 2011). "Wilkerson taking long trip to NFL draft". ESPN. Archived from the original on April 29, 2011. Retrieved April 29, 2011. ↑ Cimini, Rich (April 29, 2011). "Jets go safe route with Wilkerson". ESPN. Archived from the original on April 29, 2011. Retrieved April 29, 2011. 1 2 Associated Press (April 29, 2011). "Jets select Temple DL Wilkerson at No. 30". ESPN. Archived from the original on April 29, 2011. Retrieved April 29, 2011. ↑ Pompey, Keith (April 29, 2011). "Jets take Temple's Wilkerson in first round". Philly.com. Archived from the original on April 29, 2011. Retrieved April 29, 2011. ↑ Cimini, Rich (July 31, 2011). "Jets officially sign Santonio Holmes". ESPN. Archived from the original on September 23, 2011. Retrieved September 23, 2011. ↑ Glauber, Bob (September 7, 2011). "Debut of Jets' Wilkerson falls on Sept. 11". Newsday. Retrieved December 7, 2015. ↑ Associated Press (September 18, 2011). "Sanchez, defense lead Jets past Jaguars, 32-3". New York Post. Archived from the original on September 23, 2011. Retrieved September 23, 2011. ↑ Schwartz, Paul (April 18, 2014). "Jets pick up fifth-year option on Muhammad Wilkerson". NYPost.com. Retrieved January 11, 2016. ↑ Cimini, Rich (January 3, 2016). "Muhammad Wilkerson suffers broken leg in finale". ESPN.com. Retrieved January 11, 2016. ↑ Sessler, Marc. "Wilkerson signs five-year deal with Jets". NFL. Retrieved July 15, 2016. ↑ "Muhammad Wilkerson Stats". ESPN Internet Ventures. Retrieved 3 September 2014.